The characteristics of ultrasonic wave reflection on weld defects in electron beam welding (EBW) pistons are investigated in this paper. Based on these, we have developed ultrasonic immersion testing method with 6 probes for defects inspection. The test result shows that the ultrasonic immersion testing method can inspect the lack of penetration, lack of fusion and crack on the upper area of the cooling oil groove effectively. However, limited by the complex structure of piston, pores can only be inspected partially, so industrial computed tomography (ICT) technique is introduced for pores inspection. Combining ultrasonic immersion testing method with ICT, the entire weld defects in EBW pistons can be inspected ultimately. A type of high horsepower engine Al piston is adapted the advanced EBW complex structure. The top is shaped by permanent mold casting, the inner cooling oil groove is produced by dissolved salt core technique, high nickel austenitic casting iron carrier is made by Al-fin process on the portion of the first ring groove of the piston. The skirt part is forged with the same material as the top one. The joint between casting and forging is welded by EBW process, which formed 2 welds: one is the cylindrical weld, the other is the ring-shaped weld. The piston diameter is 150mm, the depth of the cylindrical weld and the ring-shaped weld are 40mm and 45mm respectively, the weld width is 1mm to 1.2mm. The EBW piston blank structure is shown in fig.1. Due to the materials, component fixtures, welding process, equipment stability and etc., the blank can not avoid producing some defects in welding, such as lack of penetration, lack of fusion, cracks and pores. It is designed to inspect welding defects in piston by reliable NDT technique. EBW piston structure is special, the piston top is irregular, and the feature of the EBW weld depth, width and height makes the defects gather on a narrow area, which brings a greater difficulty to non-destructive test on weld. In the paper, the study is made on ultrasonic reflection characteristics of EBW piston welding defects. On the basis of the study, the ultrasonic immersion method with 6 probes for defects inspection is designed, which inspected efficiently for the lack of penetration, the lack of fusion and cracks on the upper area of oil groove. In addition, because of the limitation to the structure, it is difficult to inspect pores completely by ultrasonic testing. In order to control the process and ensure the piston's reliability, we have researched the welding pore inspection method by the ICT. The ICT is not restricted by sample's materials, shape structures, surface and etc., with the visual image and very high spatial and density resolutions. Since the ICT inspection is complementary to the ultrasonic wave, the full non-destructive test for welding defects is realized at last. The EBW is carried on under the condition of high vacuum, the matrix material is melted by high energy electronic beam current, resulting in the welding joints to combine together. But, however, some defects are produced inevitably during welding. The surface defects includes biting-like edge, unfilled, cracks and the lack of fusion; the inner defects includes the lack of penetration, the lack of fusion, cracks and pores. The surface defects are easy to be seen through visual inspection, some of them can be removed by machining. This paper is mainly to deal with the inspection for inner defects. Controlling EBW process produces four kinds of simulation defects in the piston. The defect types include the lack of penetration, the lack of fusion, defects on the upper area of the oil groove and weld pores. It is considered that pistons have rotation symmetrization and lot inspection is needed, so the ultrasonic immersion pulse-echo method is used. The ultrasonic reflection characteristics of welding defects is studied by the testing method, including incident point, incident angle, and the influence on defect reflection of ultrasonic wave types changes, which provide the base for inspection. The test is made by USIP20GP8 ultrasonic inspection system produced by Krautkramer in Germany, and a set of TSJ-I piston immersion inspection machine developed by us. The frequency of the high performance immersion probe is 5-10MHz, the diameter of the crystal plate is 5mm. The ring-shaped weld is parallel to the piston top, and the cylindrical weld is parallel to the piston axis, the lack of penetration lies in the bottom of the effective welding area, so we can detect the ring-shaped weld from the top and the cylindrical weld from the skirt. The longitudinal wave beam vertical to the defects can get the optimum sound reflection. Take the center points of the welds as the "0" point of coordinate, the upper side of the ring-shaped weld is forward direction, the outside of the cylindrical weld is forward direction, then establish location coordinate respectively. As the probe moves, investigation can be made on changes of the defect reflection amplitude. The result shows that there are some obvious high reflection waves on the lack of penetration area, while there is little or no reflection at the root of the weld (-6~-8mm). The ultrasonic reflection of the lack of penetration of the ring-shaped weld and of the cylindrical weld presents almost the same morphology, but the difference lies in the highest reflection wave on the lack of penetration of the cylindrical weld ranging from 2mm~4mm, while the lack of penetration of the ring-shaped weld near the center point. The main reason is that the effective detection area of the cylindrical weld outside is smaller than sound beam width of the probe. The part of the sound beam is shielded when the sound wave is incident from this area. In addition, the incidence surface of top is flat, and the reflection of the ring-shaped weld is also a flat reflection, but the skirt surface is convex and the cylindrical weld reflection is convex, too. Therefore, in the area of unshielded sound beam, for the same size defects, the top detection has higher reflection wave than skirt detection. The study was made on the ultrasonic reflection of the lack of fusion defects by the same method. The result shows that the lack fusion has the same distribution with the lack of penetration in the effective welding area at the bottom of the weld. The difference only shows that at the weld root of the lack fusion still appears higher pores reflection wave, which the lack of penetration doesn't. 2.3 The ultrasonic reflection on the upper area of the cooling oil groove. It is known from  that on the water/Al interface the refraction angle in Al is at 28.8°~52.4°, the echo transmittance E1t from the transverse wave inspection is higher than that of Ell from the longitudinal wave, i.e., the inspection sensitivity is much higher by the transverse wave than that by the longitudinal wave. In addition, the velocity of the transverse wave is less than the longitudinal wave, therefore, at the same frequency, the wave length of the transverse wave is much less than the longitudinal wave, that is why the better resolution can be obtained by the transverse wave. The practical test shows: both the transverse and the longitudinal wave can detect the crack defects on the upper area of the cooling oil groove. The sample (with cylindrical holes on the upper area of the cooling oil groove) inspection indicates that the sensitivity of the transverse wave is more than 6dB higher than that of the longitudinal wave. Fig.3 shows the comparison of the inspection sensitivity by the two waves, tested by same probe and on the same other conditions. In the normal welding process, there are many pores at the whole root of the weld. The research shows that the pores are relatively concentrated on the area between -6mm~-10mm, the distribution is not very uniformed around the circumference. The highest and the lowest reflections of these pores differ over 10dB sometimes. In the declining welding section, the pores rise gradually to the area of the valid welding. In practical inspection, only if the pores exist in root area, the lack of penetration can be forgot about. It can be seen the characteristics of the weld defect ultrasonic reflection from the above test result. Fig.4 is a typical ring-shaped weld ultrasonic reflection comparison among the lack of penetration, the lack of fusion, and the root pores in good sample. A higher reflection occurs at the bottom of the effective welding area for the lack of penetration and the lack of fusion. The difference is that the lack of penetration reflection is very weak and no reflection at the area of -6mm~-10mm; that the lack of fusion has the normal pore reflection wave at the weld root. There is no reflection wave at the bottom of the effective welding area for normal welding piston, while there are some apparent pore reflection at the root of the weld. From this feature, we can distinguish from the lack of penetration, the lack of fusion and the normal welding pistons. According to EBW piston's structure feature, the defects, ultrasonic reflection characteristics of weld defects, as well as the need of lot inspection, we have designed this ultrasonic immersion test method with 6 probes. The probes are shown in Fig.5. Probe 1 detects the cylindrical weld for the lack of penetration, the lack of fusion and the pores lying in the bottom of the effective welding area; probe 2 detects pores at the cylindrical weld root, which can prove if the cylindrical weld reaches the position; probe 3 detects the defects between the cooling oil groove and the carrier, and also the defects in ring-shaped weld around these area; probe 4 detects the ring-shaped weld for the lack of penetration, the lack of fusion and the pores lying in the bottom of the effective welding area; probe 5 detects the pores at the ring-shaped weld root, which indicates if the ring-shaped weld gets to the position; probe 6 detects the cracks on the upper area of the cooling oil groove. Probes (1,2,3,4,5) use the longitudinal wave method; probe 6 uses transverse wave method. In the test, the probes do not move, a piston immersion inspection machine rotates the piston, the multi-channel ultrasonic instrument displays the signals from the six probes. According to the characteristics of the wave reflections, we have realized inspection qualitatively and quantitatively for EBW piston defects. Because of the limitation to the piston structure, the ultrasonic method can only detect the partial pores of the weld. The method is studied on piston welding pore inspection by ICT as to monitor the welding process and ensure the piston reliability. The ICT is free from the limitation to the sample's materials, shape, structure and surface, can display the two-dimensional section image of sample without destroy. The position, shape and size of the interested feature can be visualized; the interested area is not sheltered from other details around. The image dynamic range is up to 106, the density resolution to the 0.1%. We can get the digital information such as density and size from CT image. The equipment is ACTIS300 ICT system made in America BIR, which consists of a Pantak 420Kv double focus X-ray source, five-axis manipulator with linear servo drives, RLS2048 channel high resolution detector, Toshiba 225mm image intensifier, Sony high resolution CCD camera, 586 workstation, image processor, software and etc. The highest spatial resolution is 4lp/mm, the highest density resolution is 0.1%. The satisfactory piston weld CT image is obtained after the study on scanning method, calibration technique, parameter selection, image processing and so on. The ICT can make up for the shortage of ultrasonic inspection, give the reliable inspection for all pores on welding area. The CT images of the pores are visualized, the size of pore can be measured accurately. During inspection, the image intensifier mode CT is used, the piston is positioned vertically, the slice plane is parallel with the ring-shaped weld and the slice width is 0.5~1mm, the reconstruction matrix is 512´512, the inspection time for each slice is about 1 minute. 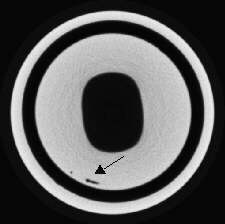 Fig.6 shows the CT image from a piston ring-shaped weld, we can see the root pores and a large bar pore (pointed by arrow). 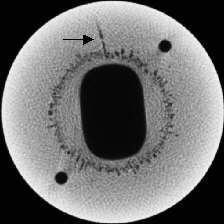 Fig 7 is another CT image from a piston cylindrical weld, we can see pores in cylindrical weld (pointed by arrow). It is proved by a lot of inspection and dissections that ICT is an ideal way of detecting EBW piston weld pores, which can meet the lot testing requirements by accurate defect location determination, reliable quantity and quality determination and inspection speed. Its application can be used for EBW piston quality control. The ultrasonic immersion testing method with 6 probes can make defect location, quantity and quality determination for EBW piston's lack of penetration, lack of fusion and the cracks on the upper area of the cooling oil groove. Due to its structure limitation, it can only detect partial area pores. The sensitivity of the immersion refraction transverse wave is superior to the refraction longitudinal wave for the inspection of the defects on the upper area of the cooling oil groove for EBW piston. ICT technique has advantages such as free from piston structure and surface, high resolution, visual image, accurate determination of defect location, quantity and quality. It can inspect weld pores of EBW piston reliably. The ultrasonic immersion testing method with 6 probes is complementary to ICT, which has eventually realized the overall inspection for EBW piston welding defects. Ultrasonic testing compiling group, Ultrasonic testing, Electronic industry publisher, 1980. Josef and Herbert Krautkramer, Ultrasonic testing of materials, Third edition, 1983. Moore, J. F., Evolution of computed tomography, Materials Evaluation, 1990, 48(5). Armisted, R. A., CT: Quantitative 3-D inspection, Advanced materials & Processes, 1988,3.